The 76-year-old Democrat, who's entering his 33rd year as state Senate president, made clear he’d work as long as his health would allow. He’s the longest-serving state Senate president ever in Maryland and in the nation. Miller’s voice shook with emotion as he introduced a Catholic priest who offered a prayer before the start of the session. “As you can see, I’m not off to a good start,” he said with a small chuckle. 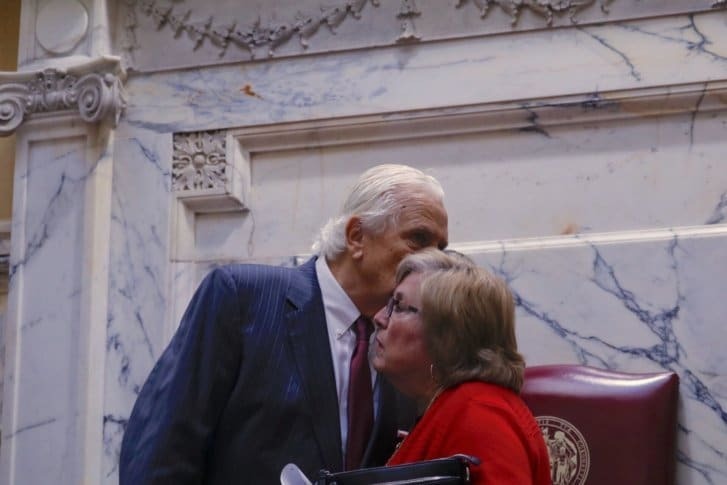 “With your continued support and indulgence, I fully intend to fight this disease as so many have and to fully carry out my Senate responsibilities,” Miller said in the statement, released as he addressed his colleagues on the second day of the state’s 90-day session. Miller said he had been experiencing significant back pain after hip and knee replacement surgery “that never seemed to heal appropriately.” He was diagnosed in July with prostate cancer, and prescribed medication and physical therapy. “Despite these treatments, the pain did not subside, and on Dec. 27, I awoke with a sharp pain in my leg,” Miller said. Hershey talked about Miller’s willingness to work across the aisle, while throwing a few barbs, too. “He’s been great about being inclusive with us here, not just on our jobs,” Hershey said. House Speaker Michael Busch, 72, had bypass surgery last year and a liver transplant the year before. Hogan, 62, was diagnosed with B-cell Non-Hodgkin lymphoma in 2015. The governor announced he was in remission in November 2016.